Early 20's. The british occultist Alejster Crowley, father of modern Satanism, funds an Abbey in Cefalù, Sicily (Italy), after a travel of mystical research in Egypt. From there he bring esoteric notions that where spread between a circle of intellectuals, gathering secretly in the Abbey for debates, ritualistic activities and ceremonial orgies, starting the Cult called "Thelema". The 7th Night of Thelema represents the esoteric ritual of Hecate, during the initiation of one of the members. The soul of the Lady by the Three Faces has been kidnapped by the Arpies, stretching her confidence until keeping her breath. A newborn one stands at the end. The vintage decadence of esoterism and 360 experimental narrative merge in a feast of subliminal visions. Love is the Law. Love under Will. After a life lived in blindness, since birth, Cassandra decides to be the first one facing an experimental surgery of implant of artificial eyes, devices that will be able to make her see for the first time. After a long and painful recovery, she is ready to take out the bandage and see, literally, the result. Come Closer is a science fiction tale based on the buddhist concept of search for self consciousness, Through a classic narravite, it suggests the existence of the material veil which is shattered by the power of the inner Eye, and kept open by the True Will. Transcend is the mother of meditation immersive experiences. Featuring Lama Luozan, an original Tibetan monk mastering in meditation practice, Transcend starts with him the journey of self exploring from a Tibetan temple along all the layers of deep consciousness. 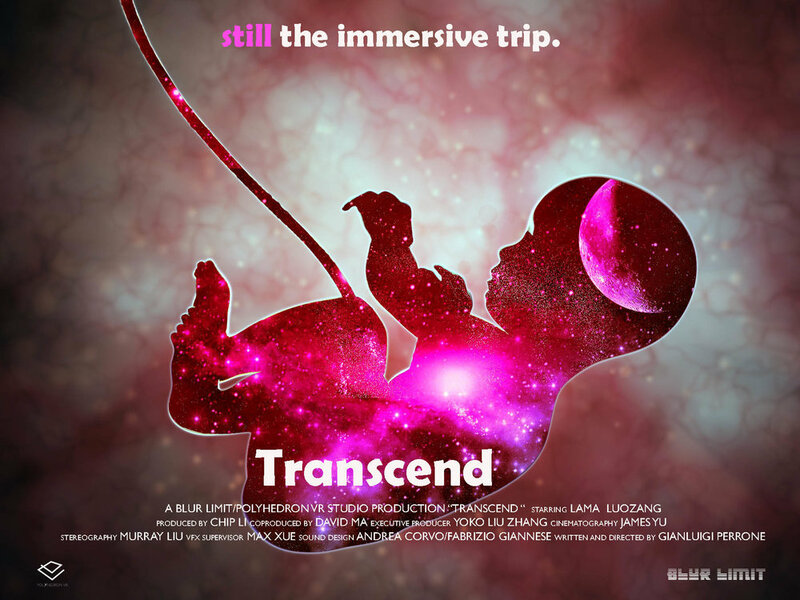 From the empting of mind until being as one with the universe, through the opening of the 7 chakras, thanks to a sensorial experimentation on CGI and sound design, Transcend will lead you inside of the womb of the Universe and the origin of everybody's existence. Inspired by Peeping Tom and Videodrome, it is a story of a cctv guard of a nuclear factory who discovers the terroristic plan of a girl working on a safety device. He will try to find a way to stop WHAT she is doing, but he will find out he has to understand the WHEN.